Before reading on, if you are short of time and ideas we can help by writing our office party speech for you! Please call Seb on 020 3651 7351 to discuss the options available. The tree is up, the stockings are hung and… it’s time to humiliate yourself at your office party. For most, this yuletide jolly is a reward for 12 months of sitting in front of a screen. For others it’s worse than the 9-5 grind. And, for a few it just means a stonking hangover. But what about the person in charge? While reckless employees gobble vol-au-vents and fall over on the dancefloor, you’re studiously avoiding the bar. Or you should be. Because, for you, the office party is a minefield. Not only does nobody want to chat and boogie with the boss, but they’re also waiting for you to trip up as you deliver your festive speech. In many ways, this is a perfect opportunity for you to reincarnate yourself as the best boss in the world. Funny, thankful and oh so generous with the free drinks – you’ll make everybody want to work even harder for you. But be careful. This is a speech that could easily backfire. Get it wrong and you’ll be the subject of office gossip long after the tinsel has been taken down. So before you knock back that glass of champagne, we suggest you put in some groundwork. This could be the only time all year that everybody in the company is gathered together. And if you’re going to inspire them, your speech needs to be pretty damn good. Many people like to think they can master fabulous off-the-cuff speaking, but only a few are able to pull it off. In truth, last-minute chancers tend to be drunk and dull – embarrassing themselves and delighting the hecklers at the back. You’ve turned off the music and stopped people dancing. Now is not the time to make them wait while you talk them through the intricacies of your five-year plan. Keep your speech to five minutes or less. You’re the host so you need to act like one. Make sure you welcome everybody, including spouses and partners if they are on the guest list. It is Christmas after all. These people work hard for you all year and if you can’t say how grateful you are… then, bah humbug! Make an effort to be sincere and humble – and they won’t forget it. It isn’t the time or place to start mentioning last summer when profits were plummeting. Focus on the good stuff that has happened over the past year – and you’ll motivate them for the next 12 months. It’s tempting to harness the festive spirit to drive your troops into 2014 like a corporate Braveheart. By all means flag-up your goals for the following year, but rein in the tub-thumping. Only David Brent, or possibly Roy Keane, would dare to give their Christmas speech the Churchill treatment (that’s Winston, not the Insurance company). We’re not saying you have to morph into Eddie Izzard, but reference a funny – and well known – office story and you’ll soon have them chortling – and on your side. Go on, make a rousing toast. It’s a great way of making everybody, from intern to manager, feel part of the team. If you stick to these rules, you should do fine. But just before you start shuffling those presentation cards, take a look at this last-minute checklist. – Practice switching on and using the microphone before you start speaking. You don’t want to be seen struggling in front of your team. – Pace it. A small vodka to steady shaky hands is fine, but have a few too many and you’ll be hiccuping your way to humiliation. – Speak loudly. It’s a party and it’s going to be noisy. If people at the back can’t hear, they’ll quickly lose interest and start chatting over you. – Be prepared for the odd heckle. There’s always one smart aleck, determined to wreak revenge on his boss. Plan a few comebacks in case. – Speak at the beginning of the party. Not only do you need to welcome people early on, but it’s always good to get the speech out of the way so you can enjoy the rest of the evening. If you’re still struggling, why not treat yourself to an early Christmas present – in the form of a professional speech writer. 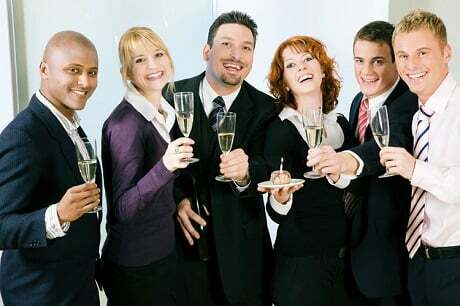 We can edit, structure, write and help you deliver your office party speech. also remember my mom in the speech since she died 3 years ago she would have been so proud of her grandson so would my dad where he died 6 years ago. Can you please, please , write a short welcome speech for our buffet evening which is organised in Aid of our organisation golden jubilee.